Many developers earn their bread and butter by writing database driven applications. That is why mastering ADO.NET features is a key skill set for any .NET developer. 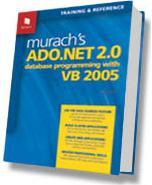 Murach's ADO.NET 2.0 gives a good start in database programming to any beginner. It will serve as an easy to use collection of "how tos" as well as a reference. The book consists of twenty chapters spread over five sections. The first section introduces you with the database programming in general and ADO.NET. It consists of five chapters. Chapter 1 and 2 offer basic introduction to database programming concepts and ADO.NET. Chapter 3 talks about creating and consuming data sources. It uses windows forms applications to teach the concepts. It also covers exception handling and DataSet designer. Chapter 4 deals with one of the favorite topic of beginners - data bound controls and parameterized queries. It also develops a simple invoice maintenance system to illustrate the concepts. Chapter 5 contains detailed drill down on DataSet designer and query builder. The invoice entry application is then developed to illustrate the techniques learned. The second section consists of five chapters and covers 3-layer application development. Chapter 6 covers common ADO.NET objects such as connection, command and data reader. Chapter 7 deals with stored procedures. Chapter 8 covers another important topic - database transactions. A typical payment transfer application shows the concepts in action. Chapter 9 covers object data sources to work with 3 layer systems. A payment entry application embosses the concepts covered in the mind of the reader. The same application is extended further in Chapter 10 giving reader a complete picture of the working of ADO.NET. Section 3 covers ADO.NET in relation to ASP.NET. Chapter 11 discusses SQL data source control and many of its features. Chapter 12 and 13 cover GridView and DetailsView controls. Finally Chapter 14 dissects object data source control. Section 4 deals mainly with DataSet features and their use in Windows based applications. Chapter 15 covers typed DataSets and table adapters. Chapter 16 deals with untyped DataSets and data adapters. DataViews and relationships between tables is the topic of Chapter 17. Section 5 is bonus section and covers several miscellaneous topics. Chapter 18 teaches you to work with XML data and XML features of SQL Server 2005. Chapter 19 focuses on using Server Explorer of Visual Studio and finally Chapter 20 discusses Crystal Reports and Crystal Report Viewer control. In nutshell, if you are a beginner looking for a good start on ADO.NET 2.0 using VB.NET as the language then this book can certainly help you. After mastering the techniques covered in this book you will get a solid foundation for advanced topics in ADO.NET.